The Gay Gamer: Step aside, Super Mario Sunshine--it's time for me to play some Shake Kids! 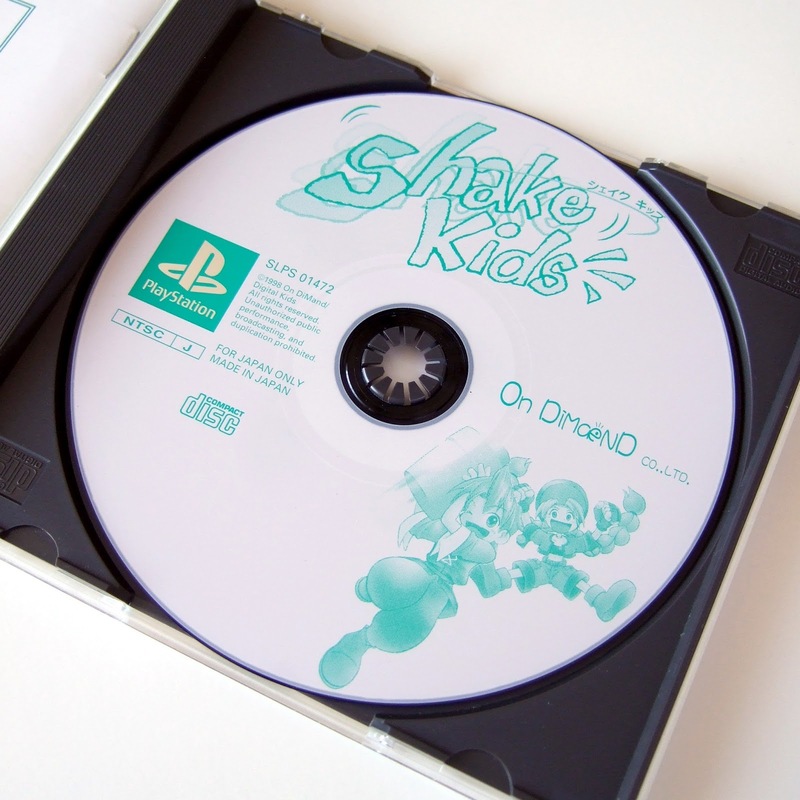 Step aside, Super Mario Sunshine--it's time for me to play some Shake Kids! At long last, "the day" has arrived. 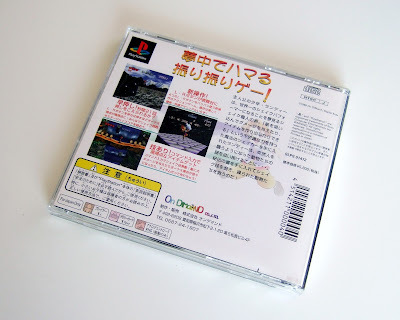 No, not the day I sell my body (or soul ... or whatever else) so I can afford to buy a PC Engine LT and still have some spending money left over for other games and systems. 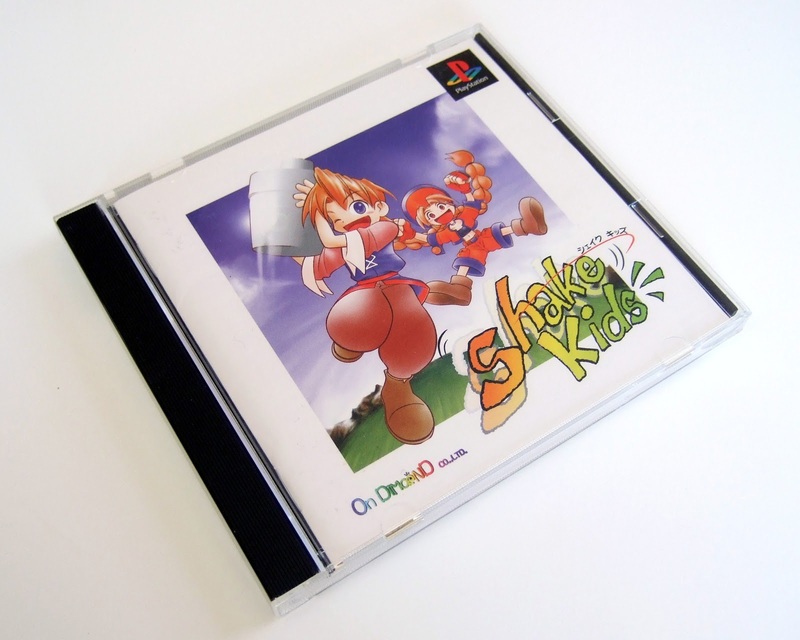 Rather, it's the day when I can finally start playing through the classic (not really) Japanese PlayStation platformer, Shake Kids! Actually, I've already spent about an hour with this delightfully odd import, so why don't I share a few early impressions of it here rather than make you wait for its eventual "Great Gaymathon" review? Before I chat about Shake Kids' graphics and gameplay, though, I thought I'd share a few thoughts on its packaging, which can be seen in photos throughout this post. To be honest, its likely some would describe its graphics, soundtrack and gameplay as "meh," too, although I'm personally finding both aspects to be at least somewhat appealing in the early goings. A good part of the appeal for me is in the game's oddball setting and premise--the latter of which puts players in the shoes of one of two characters (a fairly generic-looking boy or girl) who, for some reason currently unbeknownst to me (I can't understand the story), use cocktails shakers as weapons against the assortment of baddies they encounter during their side-scrolling adventure. Strangely, said cocktail shakers quickly return to their owners after they've been thrown, as if they're chrome-plated yo-yos rather than shiny bar implements. Most enemies can be taken out with a few well-placed hits, by the way, although that's not the only option made available to players. Another: after scooping groups of baddies into their shakers, gamers are transported to an alternate reality that can only be described as a disco-ball-topped dance floor, where they shake their butts (and everything else) until the trapped enemies expire. All of the above is portrayed in rather rough (graphical) fashion, it has to be said. Of course, it's clear from the second you start the game that this title's makers, like many of their counterparts at the time, struggled with the transition from sprites to polygons. Still, I find its blocky graphics to be pretty charming in a Rankin/Bass Productions (of "Rudolph the Red-Nosed Reindeer" fame) sort of way. I do wish the game's artists and designers had gone a little further with its look, though. Too often, Shake Kids' locales and even enemies are the definition of drab. A few more touches like the house that's shaped like an octopus (encountered at the very beginning of the game) could have made the final product so much more enticing. Thankfully, drab is the last word I'd use to describe this import-only title's music. Of course, it's hard to hate on a soundtrack that's so full of energetic, late-1990s flair. I'll continue to poke and prod at Shake Kids! in the coming days and weeks in the hopes of experiencing enough of it to be able to produce yet another "Great Gaymathon" review. In the meantime, you may enjoy checking out this YouTube clip, which shines a light on a number of the elements I've mentioned here. Yikes. And...yikes. That video...so late 90s. So polygonal...so muddy. Interesting concept, though. Glad to know the music at least is good, that was one of the things that really struck me about the video when I saw it before (I imagine the chances of finding a ripped soundtrack are slim to none). Good music can really make a difference in a game like this. this game is so deliriously bonkers that it kind of makes up for how mediocre it is. I wouldn't say it's amazing or anything, Michael. And some are sure to say it's cheesy. I like it quite a bit, though. Well well. No wonder you took a break. This game certainly looks like an interesting play. Yes, Roddrick, it's certainly interesting. Good? I wouldn't go that far :P If you can find it for a few bucks, though, and you like weird games, I'd say go for it. Well, maybe if I can find some easy way to rip the soundtrack, I can send it to you. i don't suppose you know anything about that?? I didn't know that, Michael, so thanks for sharing it! I'll do some digging into all of this myself this weekend, OK?